We had several busy days visiting castles and other tourist sites on our stops in Prague and Cesky Krumlov. Our rafting trip along the Vltava River was cancelled because it was still early in the season. The waters were not high enough over some rocky parts. But our tour guide Vashek had a fun day planned for us. 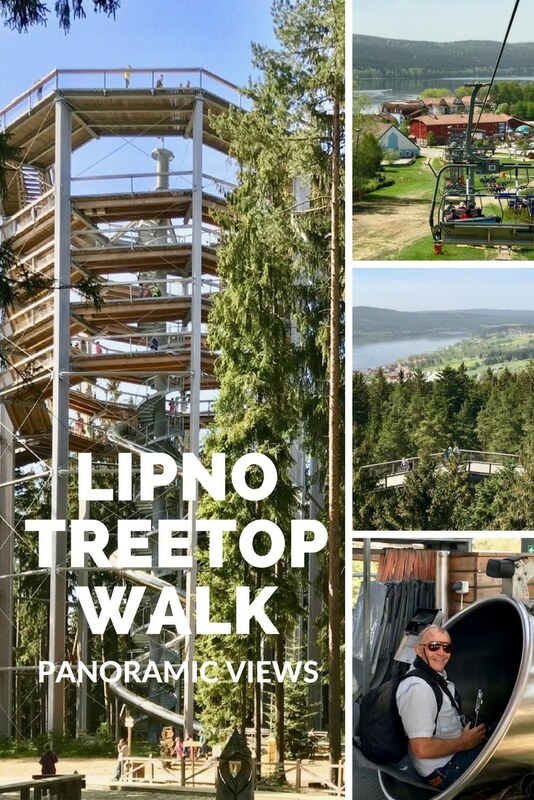 We headed into the countryside at Lipno nad Vltavou to the Lipno Treetop Walk. Climbing high to the top of the tower gave us a great view of the Czech countryside. And the ride down the long circular slide was plain fun! 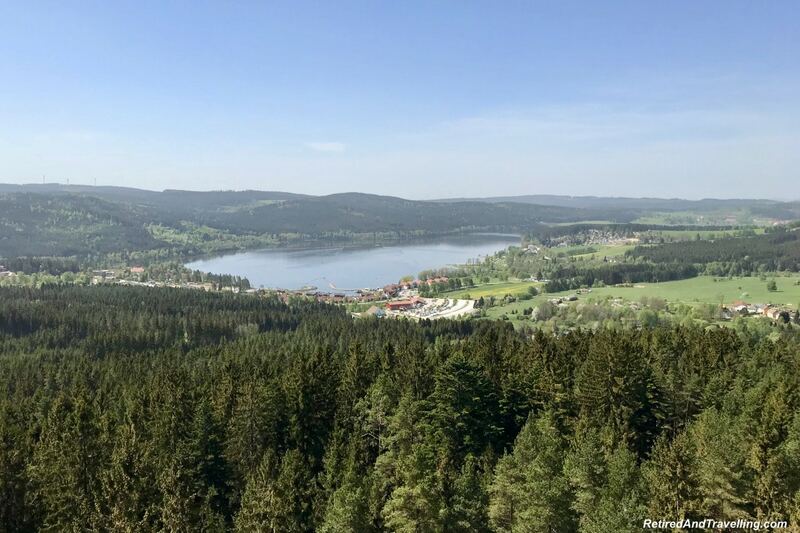 As we approached the park in Lipno nad Vltavou, we passed the Lipno Dam. 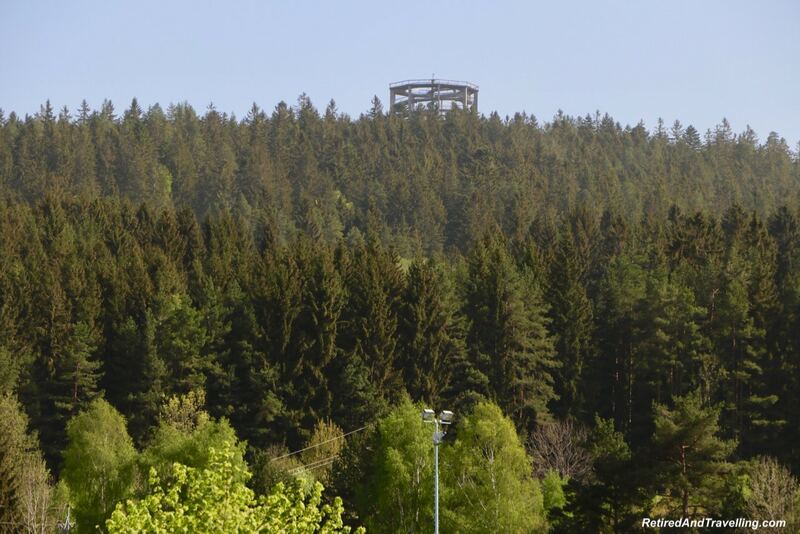 The tower for the Lipno Treetop Walk stood high above the trees (about 130 feet (40m) above the summit of the hills). That was our destination for the day. 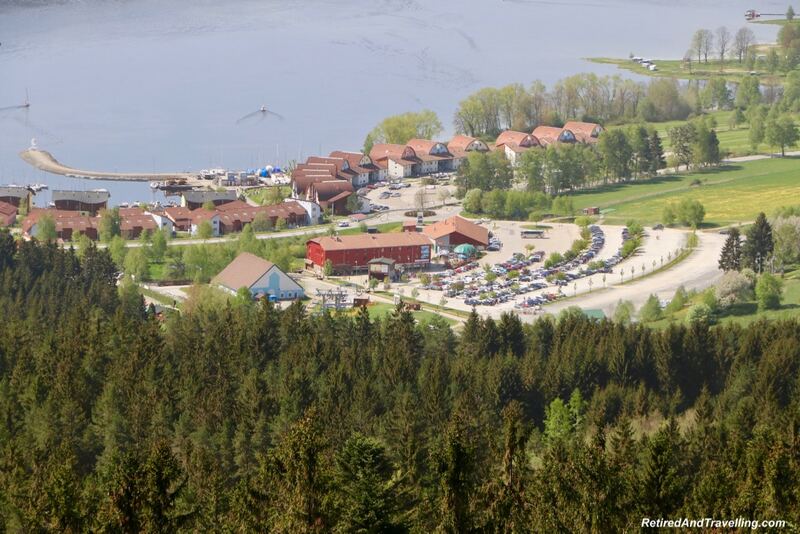 The Lipno Park in Lipno nad Vltavou was used in the winter and summer. In the winter, it was used as ski hills. We were told that there was snow on the hills a few weeks ago and there was one pile of snow in the field. Several different chair lifts covered the ski runs. 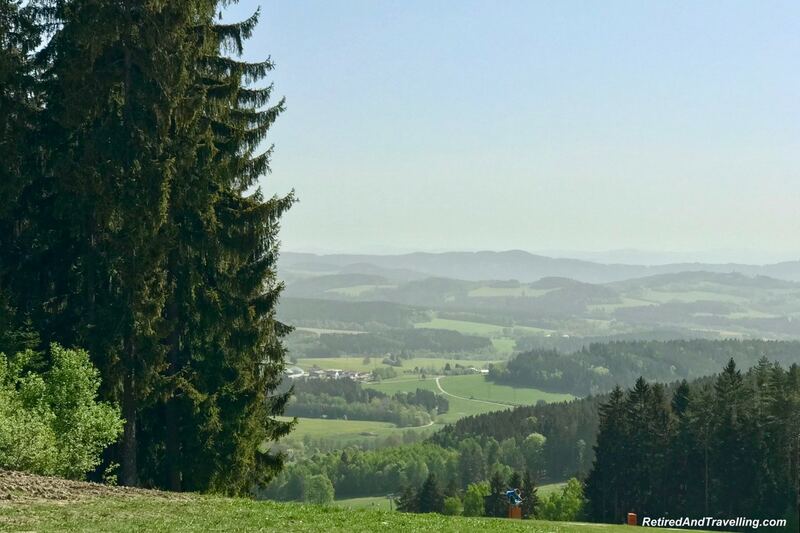 Most of the hills were quite gentle and the ski park was used largely by families and beginners. 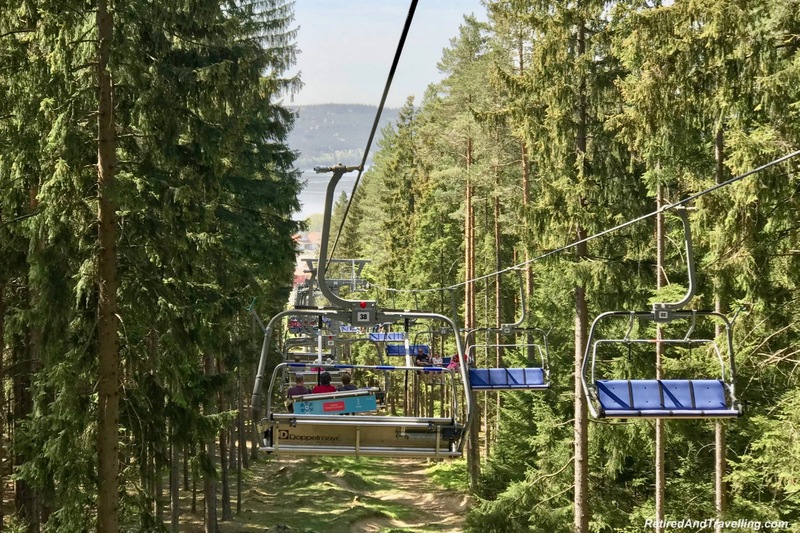 In the summer, the chair lift was used to take people up to the summit and to the Lipno Treetop Walk. 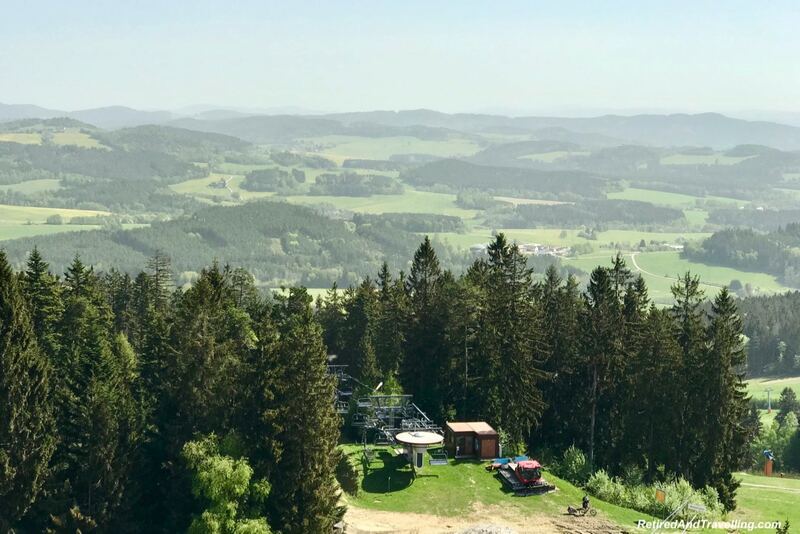 Most people went up the chair lift to then go up in the tower for a view of the Czech countryside. The lift was also used by mountain bikers. 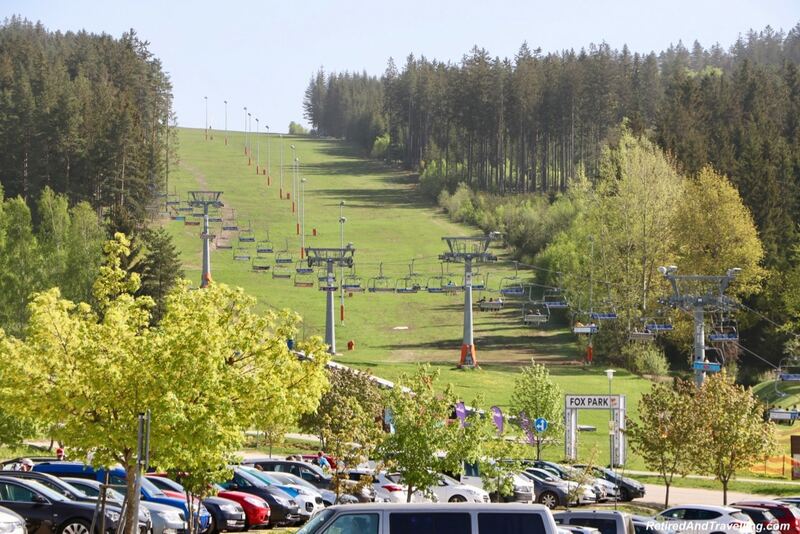 The bikes were put on the chair lift and then the bikers rode down the trails under the lift. We saw lots of families out on the sunny day in April that we visited. When we looked at the license plates in the parking lot, it was clear that visitors came from both the Czech Republic and nearby Austria. The Austrian border at this point was not far away. 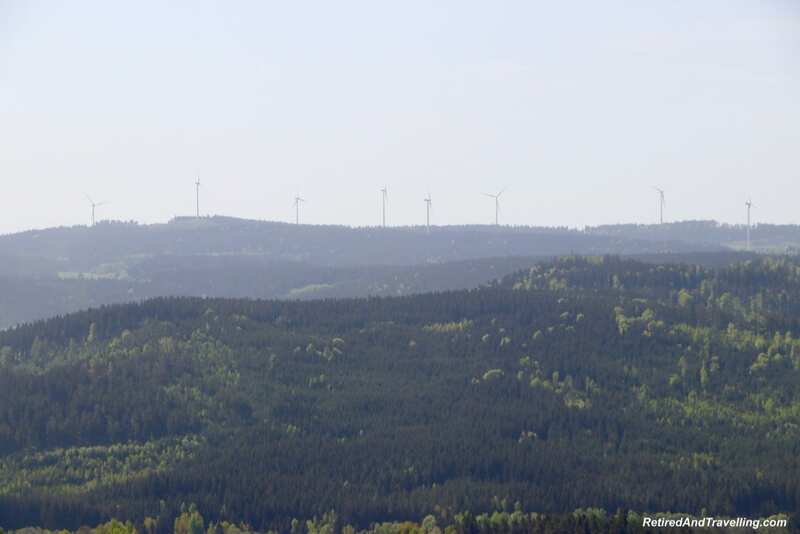 In fact, when we got to the top of the Lipno Treetop Walk we could see a large windmill farm located in Germany! There were paths that could be used to walk up and down the hills. Bikes and scooters were available to rent at the top for a different way to get back down. A shuttle bus also went from the base station to the base of the tower for people who did not want to take the chair lift. Vashek purchased tickets to get us up and down the hill on the chair lift. We went up in groups of four on the chair lift. It went very slowly so we got a great first view of the Czech countryside as we rode up. The chair lift operator was prepared for people not used to riding chair lifts. He was quick to stop the chair lift if people struggled to get on our off the seats. 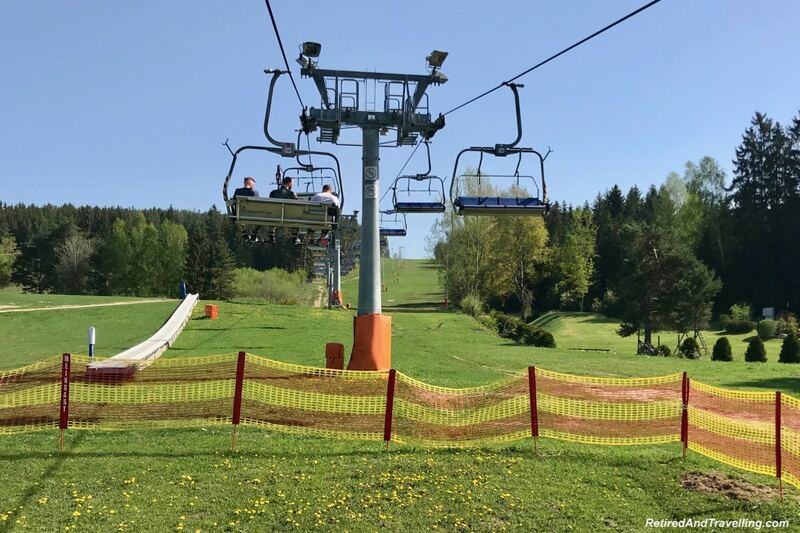 Once we got off the chair lift, we walked towards the tower and Lipno Treetop Walk. At this point, we had to decide how we wanted to get back down the tower. The path up was a gentle walk. You could get back down the same way. Or you could come down a twisty metal slide. 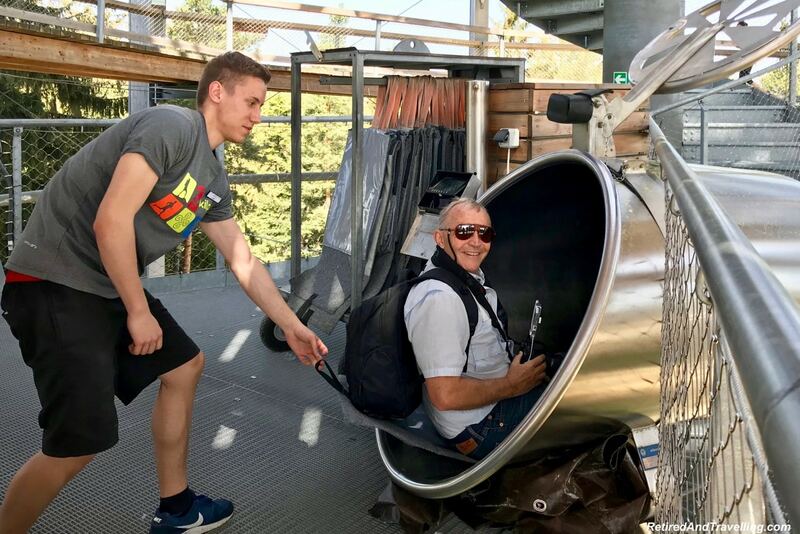 Of course David and I wanted the slide ride down from the Lipno Treetop Walk! 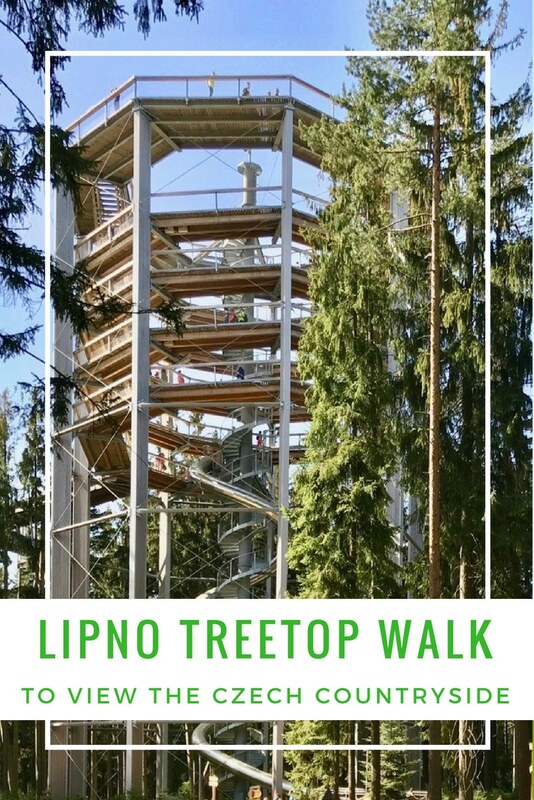 The Lipno Treetop Walk was a gentle sloped walk along the treetops. At several points there were viewpoints set up in all directions. On the viewing platforms we found some carved wooden art. Many people used these as props to pose. Along the way we found several educational spots. The signs talked about the views, the trees and many other ecological messages. 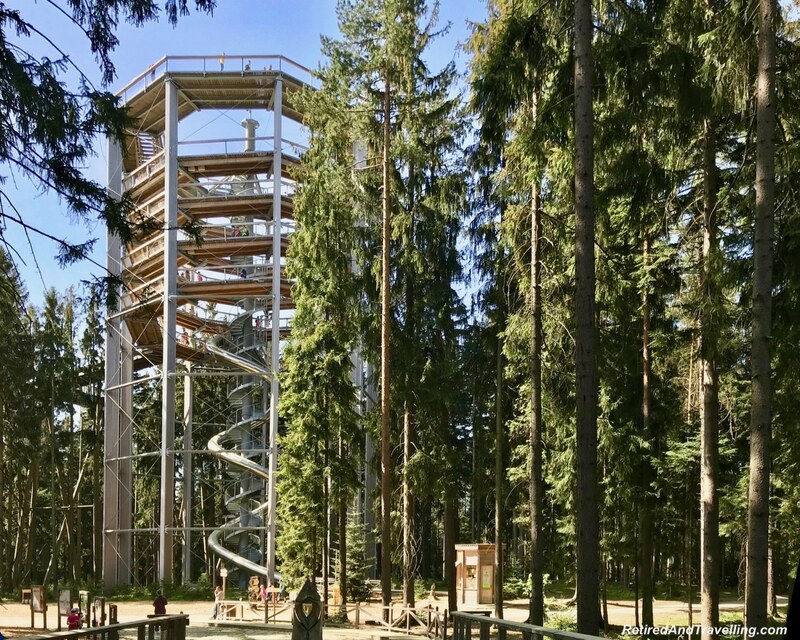 Several spots on the Lipno Treetop Walk also had some fun activities for the kids. Or the kids at heart! We walked across suspended platforms, balanced on boards and walked the plank. 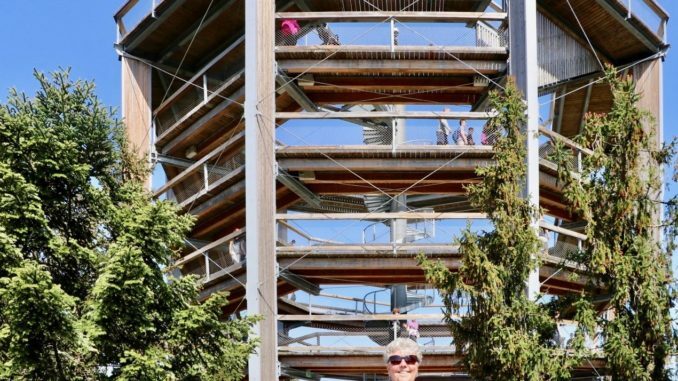 The gentle sloped path of the Lipno Treetop Walk ended at the bottom of the tower. The sloped path continued around the tower to the top. At the end there was one small set of steps to get to the top. The upper platform of the tower provided a 360 degree view of the Czech countryside. We could see the various paths and chair lifts used in the winter for skiing. We got a great view out over the trees and could see the extent of the forest cover. 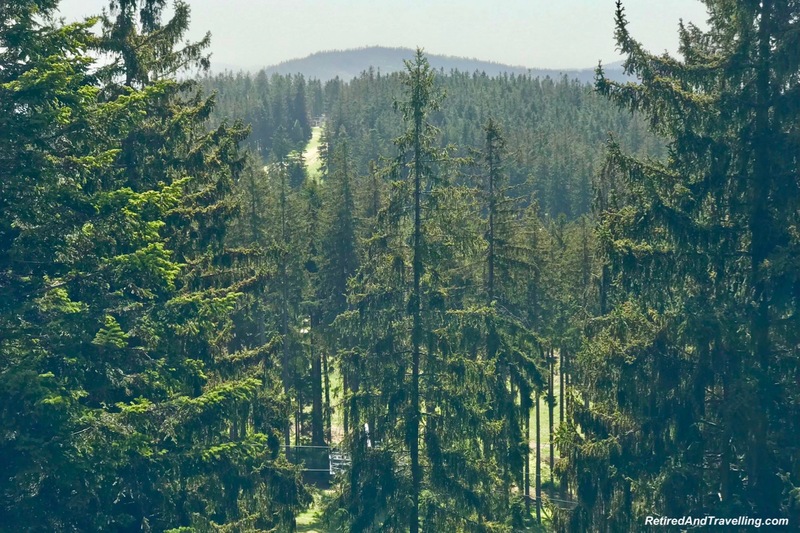 Forestry is a big industry in the Czech Republic. Ahead of us we saw the main base station below us and the chair lift we took to the top. We saw the large Lipno Lake that ended in the Lipno Dam. Around the lake was a large community. Vashek said that many of the building were recreational condos. 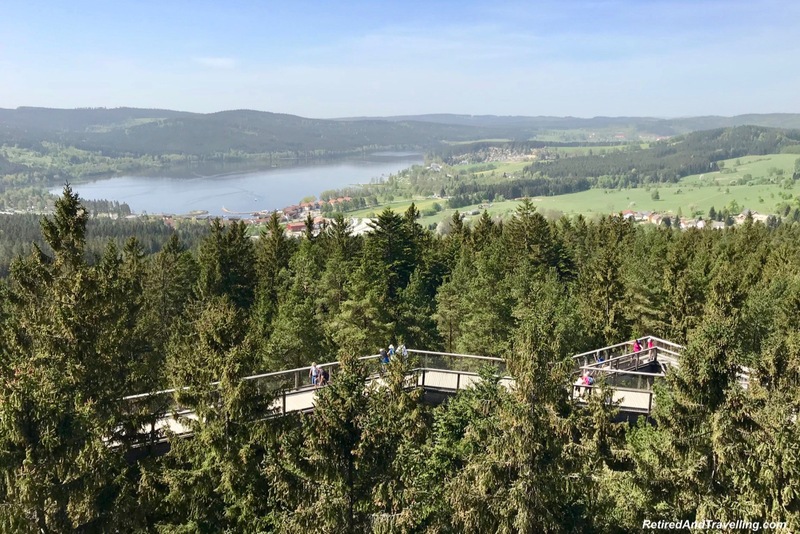 The Lipno Treetop Walk provided the perfect spot to get a view of the Czech countryside and beyond. 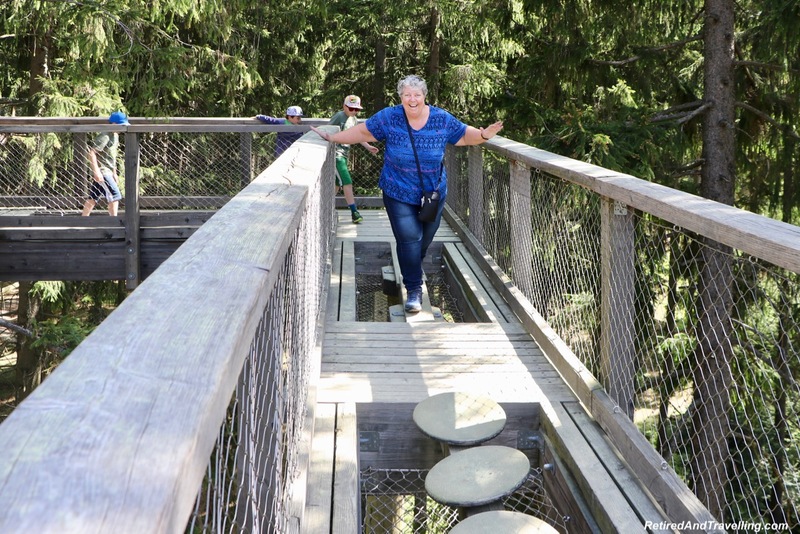 About half of our group decided they would walk back down the Lipno Treetop Walk the way we had come. The rest of us went to the start of the big slide. We watched the first few people to get the hang of the process. When it was David’s turn, he got settled on the slide and turned back with a big smile on his face. His camera and iPhone were set up so he could video his trip down. When it was my turn, I settled on the burlap mat and pushed off. I hooted and hollered all the way down. I knew David would have his video on when I exited the tunnel. It was a fun way to leave the Lipno Treetop Walk. We were really glad we did it this way. We considered walking down the ski hill to the base station from that point. But a need for a coffee break won out. After we had our caffeine fix we got back on the chair lift to go down the hill. It was a great way for a last view of the Czech countryside. After our visit to the Lipno Treetop Walk, the group re-assembled at the bottom of the hill for our trip back to Cesky Krumlov. It was a perfect weather day. The temperatures were warm and the visibility was great. The chair lift gave us a slow view of the countryside. 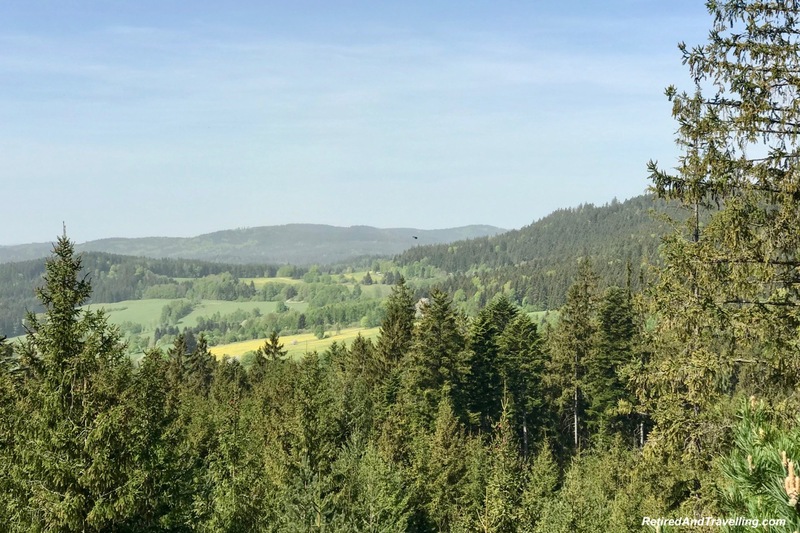 The gentle walk on the Lipno Treetop Walk let us catch different views. And the view from the top of the tower provided the perfect 360° view of the Czech countryside. If you visit Cesky Krumlov, don’t miss the great medieval town. 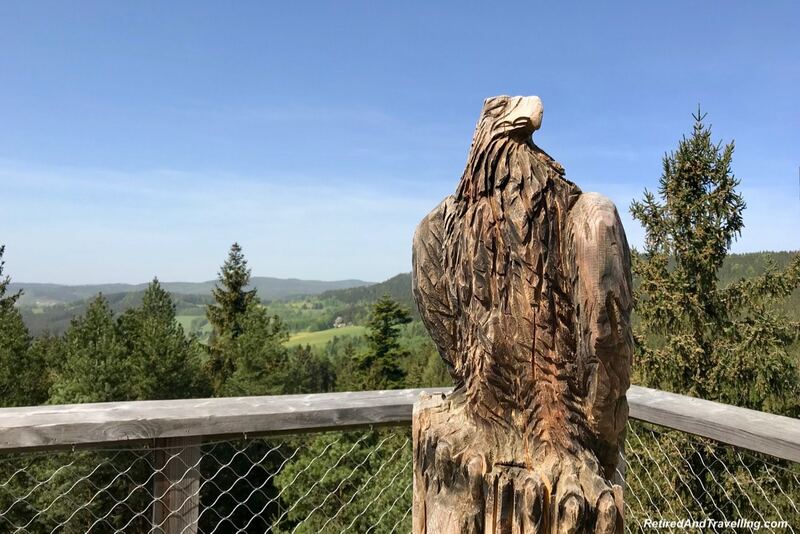 But if you stay for a few days, make sure to plan to catch a view of the Czech countryside from the Lipno Treetop Walk. It was a great spot for everyone. We got great views and some fun too. 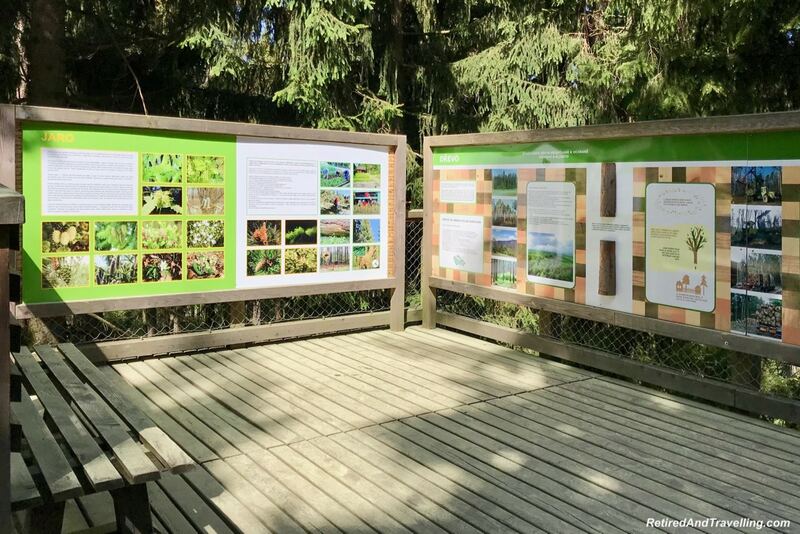 Have you caught a view of the Czech countryside from the Lipno Treetop Walk? Where did you get your view? Love it! Such a great view of the countryside and such a fun way to get down from being on the top! I’ve always wanted to slide down like this (like a video I’ve seen one in Switzerland, I believe). Great place for kids at heart 🙂 Glad you got down that way to have fun! I love treetop walks! 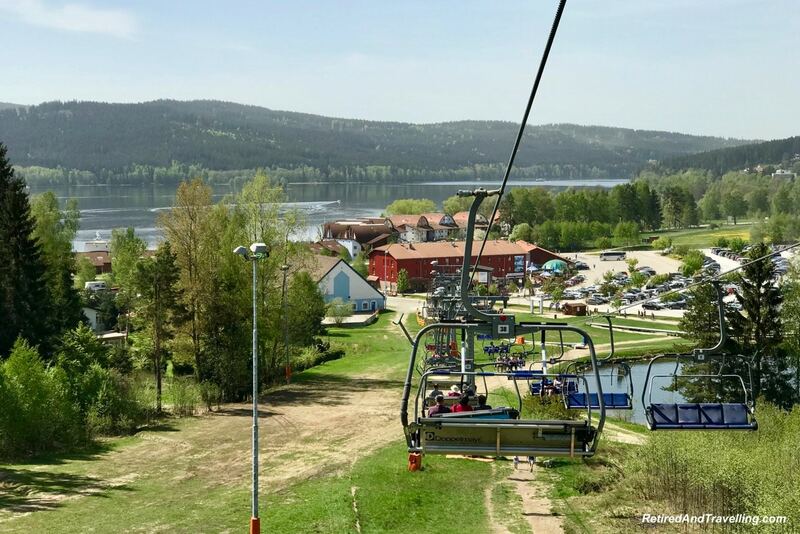 The one in Lipno looks well worth a visit, and that you can take a cable car to reach it. Love the option to take a slide down from the tree top rather than the gentle spiral walkway! Us too – retired and traveling!!! A great option from the floor to the ceiling – no water trip but a treetop trip – love it!! Sounds like fun – chairlift to the top (we were skiers most of our lives – but I cannot ski anymore) and bike or scooter down. Although, I may be a little more wary at my age. It’s quite a bridge, and I have crossed more tenuous ones in our travels. 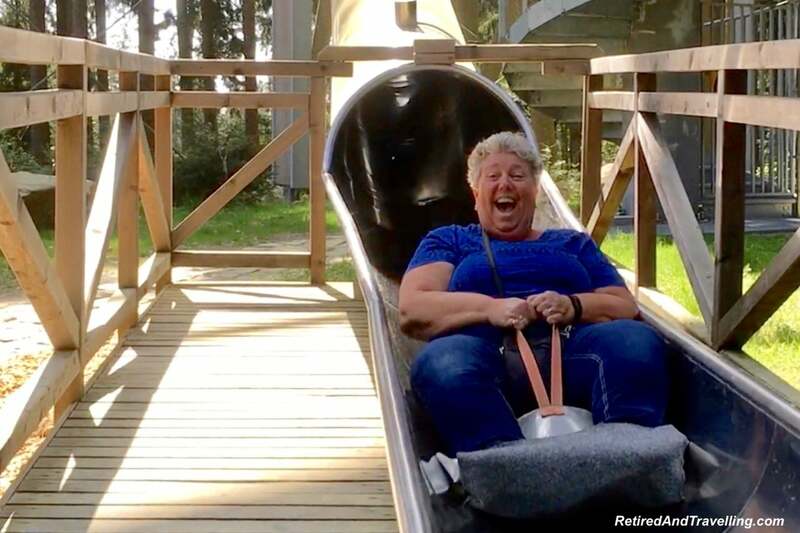 That slide – what a hoot!! wow, all those fir trees are gorgeous! 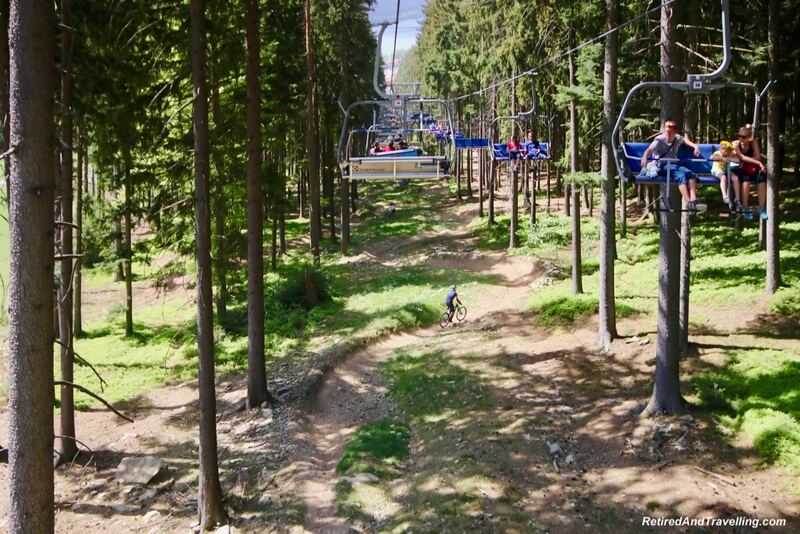 I love the ski lift doubling as a cable car/mountain-bike transport system. 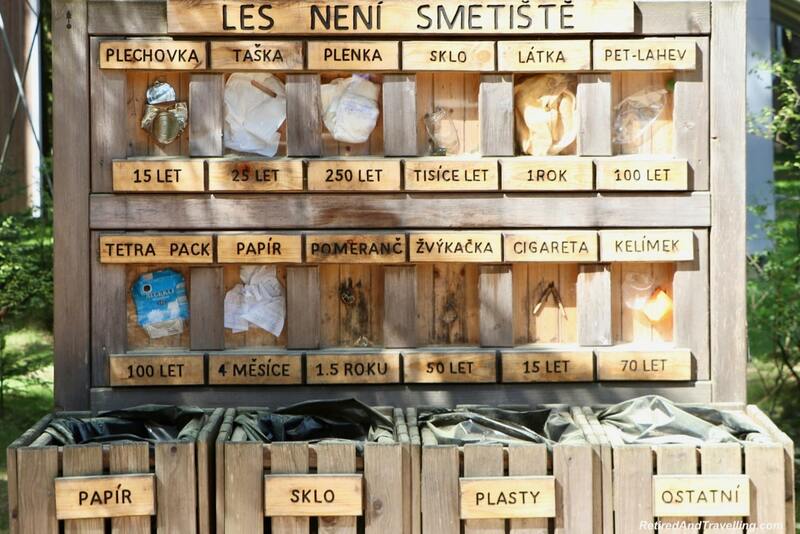 I had never heard of Lipno! It looks like such a lovely place to get a fantastic view of the countryside. Love the fast way down. I would have never guessed that a slide would be the end of this experience! How cool! What an interesting way to see above the treetops. I love those interactive aspects they incorporated. I’d definitely would take the slide down too. You look so happy in that last photo! Love it. 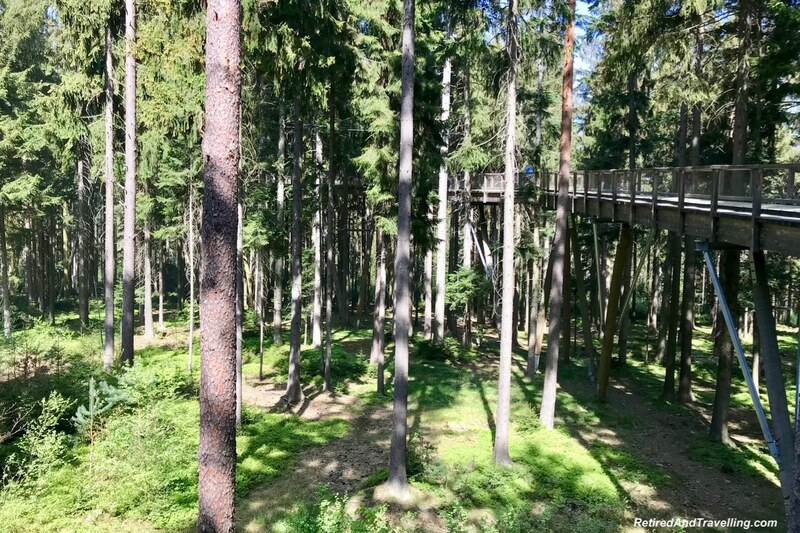 The treetop walk looks absolutely lovely and the views are beautiful from it. 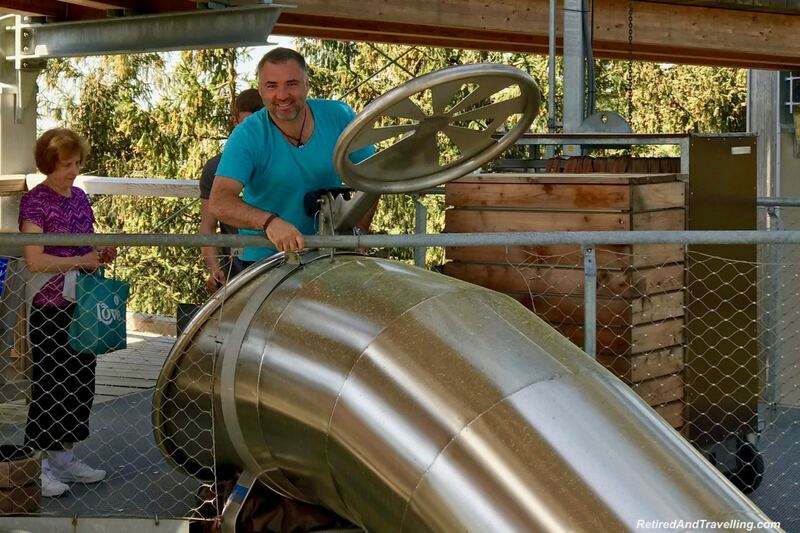 The slide looks like a lot of fun and you’re never too old for a slide! I have seen many of the major towns of Czech but I think these are the first glimpses I have seen of its countryside. 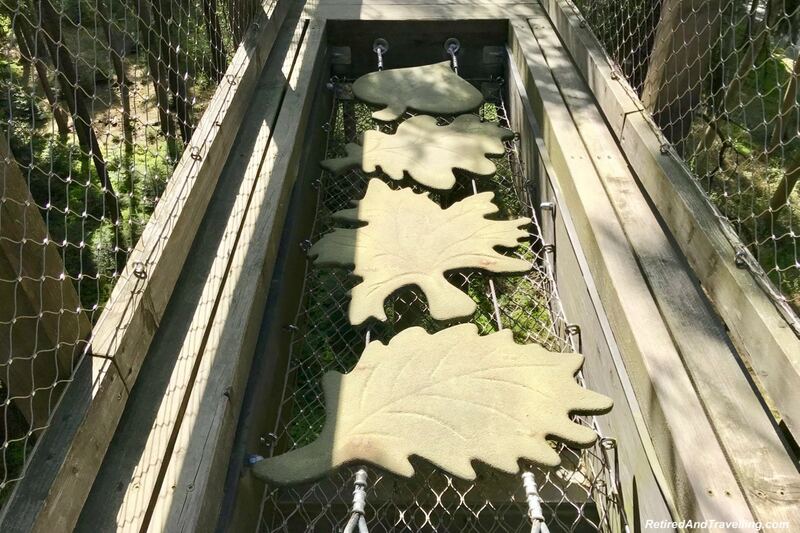 Treetop walk is a really innovative idea. Never thought of something like this. I think it can be implemented in a lot of places. You had me at the chairlift ride, they are always so pretty. 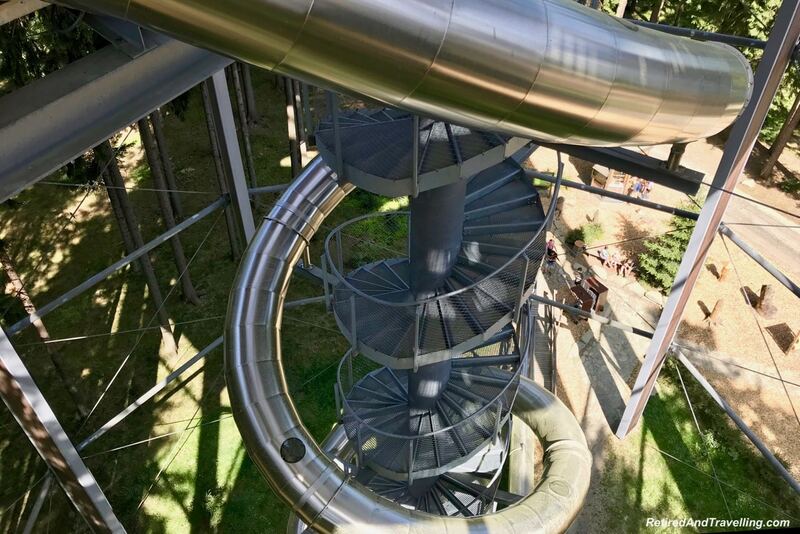 I was more in when I saw the tall trees but that twisting slide sealed the deal — so much fun!